I should mention that this is not really meant to be a ‘serious addition’ to the train sim content available as it was done as an academic exercise to see whether or not it was possible to merge two routes with different origins. I initially messed about with some game files to get a big Midlands station into another route as a template and then one thing has led to another. In the end this is actually a merge of three routes. The main route is WCML North. Therefore other DLC which is built for WCML North will work with this route. The only exception is ANYTHING which affects the Tracks.bin file – Track upgrades probably work but edit this file at your own risk. 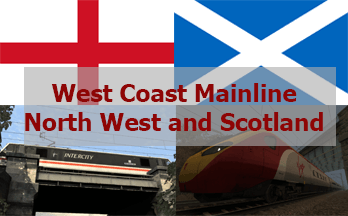 Upgrades for WCML Over Shap or the DPS route will not import into this route. By all means request that I add them to a future release and I will see what I can do. It has been built on the AP track enhancement so if you don’t have this pack installed the track may look a little clunky in places. Just north of Carstairs on the way to Edinburgh there is a pretty obvious track texture change and the OHLE height changes. The MixMap (terrain textures) are not 100% lined up just north of Carlisle. By today’s route standards the lineside on both routes is a little dated. There is no superelevation on the portion north of Carlisle. The area just south of Carlisle is not perfect. This is the joint between the two routes and required rebuilding. This is a 220 mile route plus all the suburban bits around Glasgow. It MAY NOT BE STABLE in 32 bit Train Simulator. It should be OK in 64 bit. There is now much more route to drive at once. 193 miles between Preston and Glasgow and 190 miles between Preston and Edinburgh. I have removed quite a lot of ‘stuff’ which affects route performance so it should run a little better. Once my other project which concerns the WCML is done I shall look to add that to this route. It’s free but donations are more than welcome and go to developing other train sim things. If you make a scenario for this route and would like it hosting somewhere – please get in touch. Danny from ‘Danny’s Route Photography’ page on Facebook for lots of support and advice. Ash Lightfoot and Dom Cazaux – for general encouragement and support. My Uncle Tim and a family friend Tony, for a lot of advice and help on the programming side of this. Copy the ‘Content’ folder into your TSX directory. To use the AP weather and skies as default in QD scenarios, open the “RouteProperties AP Weather” folder and copy the “Content” folder into your Train Simulator directory. Great route but Why am I not getting Edinburgh in quick drive menu despite having all required DLC installed? Great work do love this route, however i have noticed i can’t seem to get to Edinburgh From Either Glasgow or Preston any idea on what is going?